At KMMA we teach Freestyle Kickboxing, Muay Thai and Krav Maga. Within these three forms a prospective student is sure to find what they're looking for and what suits their body type and limitations. FREESTYLE KICKBOXING: We teach Karate based Kickboxing for all ages both male and female. Teaching a combination of kicks, punches blocks and sweeps. Control and discipline being key factors. Students work in pairs one holding focus pads whilst the other wears the boxing gloves. Each partner executes the combination for about 3 mins per round. Resting whilst holding the pads. (All equipment is provided for students in class at all times ). Exercise made fun, with extremely enjoyable loud pumping music, fantastic atmosphere and exciting and very productive classes guaranteed every time. Sparring only is permitted for students who have passed a blue belt status, and is semi contact controlled sparring, whist wearing approved protective equipment . We pride ourselves on holding a zero accidents and broken bones record to which we want to continue. Students must hold a current license and insurance if they wish to spar with another student. 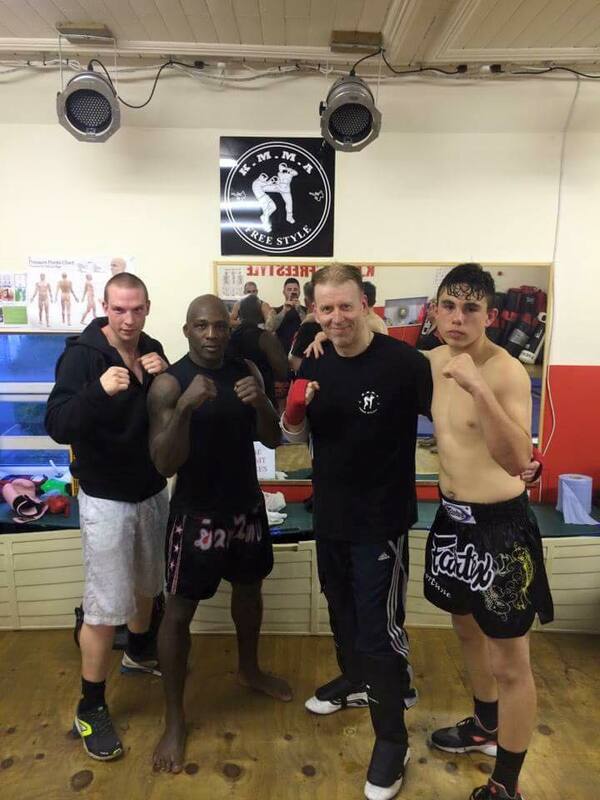 MUAY THAI: Muay Thai is a recent edition to the KMMA roster taught by Instructor Jeff Burns trainer of British, European and World Champions over 30 years experience in the Martial Arts. Muay Thai is a combat sport of Thailand that uses stand-up striking along with various clinching techniques. This physical and mental discipline which includes combat on shins is known as "the art of eight limbs" because it is characterized by the combined use of fists, elbows, knees, shins, being associated with a good physical preparation that makes a full-contact fighter very efficient. We work through footwork, kicking combinations and controlled sparring techniques. KRAV MAGAI: Krav Maga is a self-defence system developed for the military in Israel that consists of a wide combination of techniques sourced from Aikido, Judo, Boxing and Wrestling along with realistic fight training. Krav Maga is known for its focus on real-world situations and its extremely efficient and brutal counter-attacks. It was derived from street-fighting skills. Krav Maga has a philosophy emphasizing threat neutralization, simultaneous defensive and offensive manoeuvres, and aggression. Training can also cover situational awareness to develop an understanding of one's surroundings, learning to understand the psychology of a street confrontation, and identifying potential threats before an attack occurs. It may also cover ways to deal with physical and verbal methods to avoid violence whenever possible.